Lex at Waterfront Station (formerly known as Sky House West) was purchased by Bernstein Management and started leasing units last month. Over the past three years, three new apartment buildings have opened in Southwest, bringing more than 800 units online. 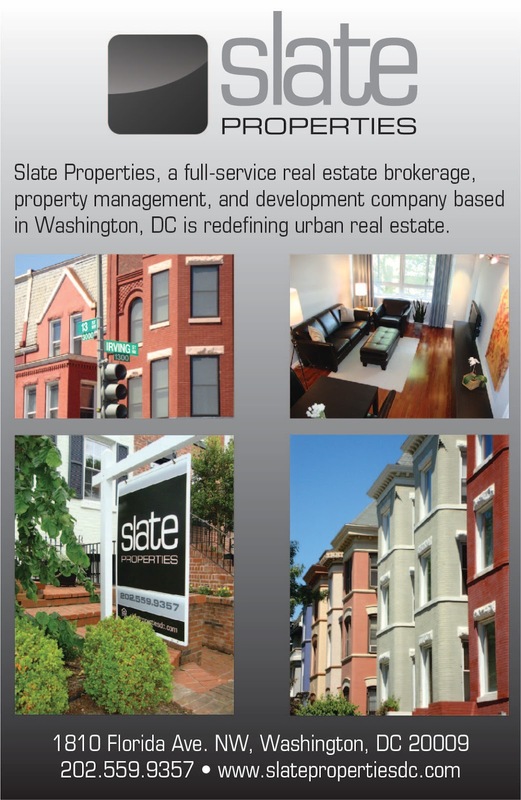 Camden South Capitol opened in the spring of 2013; Sky House East began leasing in early 2014; and Lex at Waterfront Station is the newest apartment project. Rents range from $1,600 for a studio to $3,480 for a large 2BR unit. Below are some photos of the exterior and interior amenity spaces on the first floor of Lex. There is an extensive outdoor amenity space with a fireplace, BBQ grills, benches, and green space. The club room contains a large screen TV and several seating areas. The club room also contains a pool table and kitchen. Near the lounge is the mail room. The lobby has several seating areas in nooks, but also has open areas. RD Jones designed the interior spaces in the building. 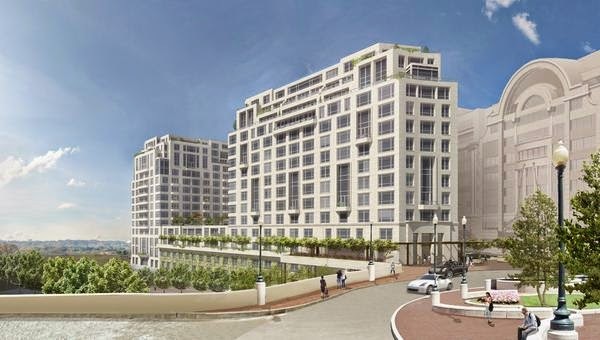 There have been at least three different iterations of the design of Pepco’s planned Waterfront substation at 1st and Q streets on Buzzard Point. The first design took its cues from neighboring Fort McNair to resemble an office building. After receiving feedback from the community, CORE Architects redesigned the building, but has been further refined since then. The latest design proposal plays on the area’s industrial past & present. Green space, artistic features, and a plaza have been incorporated into the design; however, other tweaks may be made in the coming weeks. The above rendering is the current design, looking at the intersection of 1st and R streets; see below to see how the design has evolved since 2013. Same intersection from October 2014 redesign. The ANC voted on a resolution this week to work with DC Climate Action to create a working group addressing health and safety issues related to the construction and operation of the substation, as well as its proposed size. 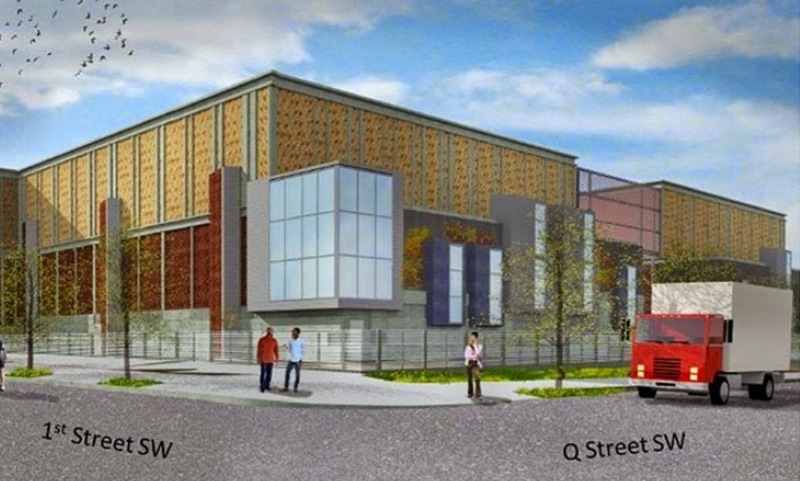 Pepco is seeking approval from the Public Service Commission to build the substation, which plans to open by 2017 before the existing substation a few blocks away surpasses capacity. Below is a video of how underground transmission lines are installed. These will be built on 2nd Street between Q and T streets, as well as R and T streets between 1st and 2nd streets. Back in January, representatives from Vornado and Forest City came before the ANC to seek their support for a two-year extension of stage one PUD approval for the planned office buildings on the southeast and southwest parcels at Waterfront Station. The commissioners tabled discussion on the resolution – one of their main concerns was the lack of activation of the vacant sites. One month later, the developers have come back with some ideas to transform the southwest lot into a “Community Square” with flexible event space, outdoor seating, a stage on top of the existing stairwell, green space, and perhaps a beach volleyball court on the far west side of the site. Over the past few months, the developers have slowly begun activating the space. About 400 people came to the SOUP-er Bowl event last month and a Fashion Truck event was held in December. However, expect more activity on the vacant parcels in coming months. An event called Hunt DC will be held on April 25 where 1,500 to 2,000 people are expected to attend. Hunt DC is a city-wide treasure hunt that will start and end at Waterfront Station. There are preliminary plans to hold a night market each Friday starting in May, beginning with 25 vendors. In addition, a monthly food truck event will be held in the Community Square. Meanwhile, the southeast parcel will remain green space, which could potentially be used as kickball fields by U.S.S. league. Another concern of the commissioners was the lack of signage along the private drive that runs between Safeway and the Metro entrance. The road is one-way going away from 4th Street, serving as an access point to Sky House and Lex at Waterfront Station. Many pedestrians are unaware of the road’s existence due to its design and according to the commissioners it poses a safety hazard. The developers presented signage improvements that will soon be installed along the private drive on both sides of 4th Street. 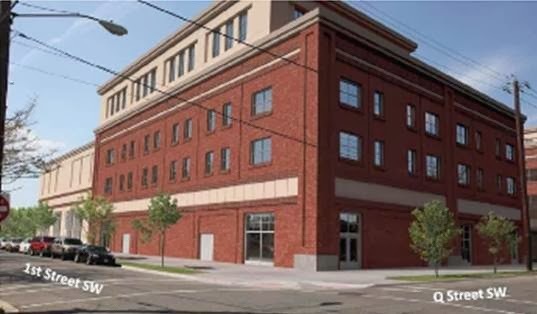 Upon hearing about the planned activation of the vacant spaces and road signage improvements, the commissioners voted unanimously to support the PUD extension. Museum officials, architects, contractors, and the media gathered today in a tent on Virginia Avenue to mark the start of demolition to make way for Museum of the Bible at 300 D Street. Although demolition has been underway at the site since the last tenants moved out in December, today’s ceremonial event included demolition of a portion of the building. 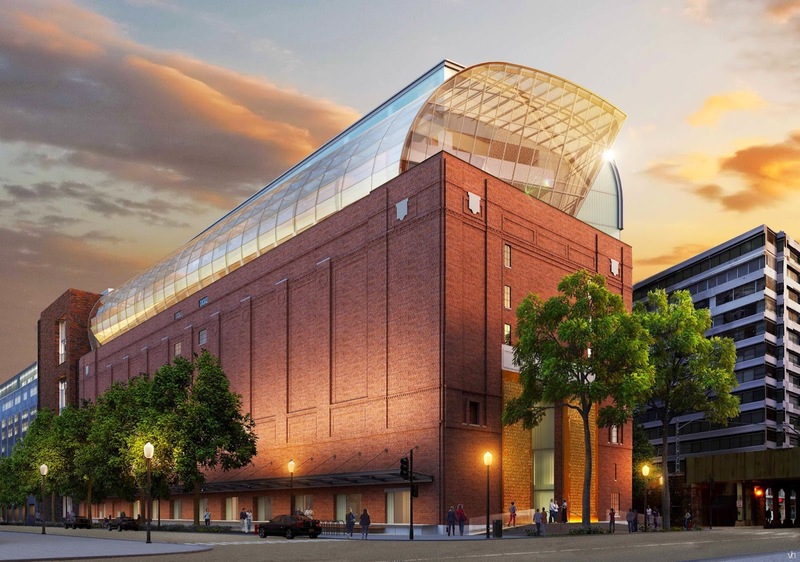 According to Cary Summers, president of Museum of the Bible there are currently about 100 workers on-site, but over the coming months of demolition, that number will increase to 500-600 workers. Clark Construction will build the museum and SmithGroupJJR is the lead architect. The 430,000 square-foot Museum of the Bible will include three exhibit floors that will tell the impact, narrative, and history of the Bible. C&G Partners, BRC Imagination Arts, and The PRD Group will be designing each of these floors, respectively, while Jonathan Martin Creative will recreate a replica of a first-century Nazareth village. There will also be exhibit space for affiliated museums and libraries as well as space for a traveling exhibit gallery. 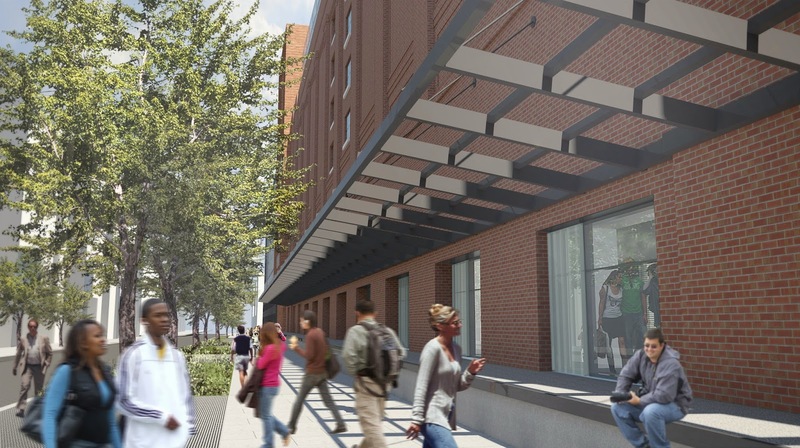 The $400 million museum project also includes a one-story addition to the adjacent Washington Office Center, adding space for the museum’s research program, which include a reference library, research labs, and an academic conference center. 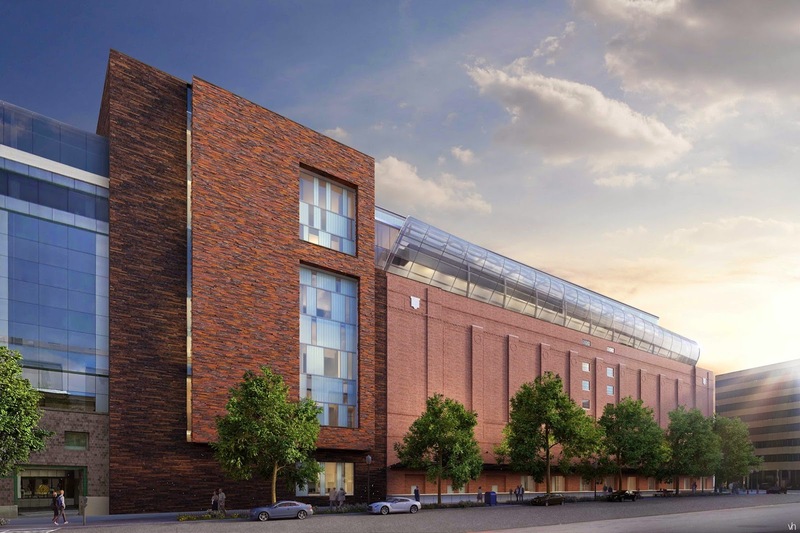 SmithGroupJJR’s design for the museum calls for the restoration of the historic building which once served as a refrigeration warehouse (and most recently as the Washington Design Center). The 1980’s-era addition to the historic building will be demolished and replaced with a new structure made of thin brick made to look like stacks of manuscripts. 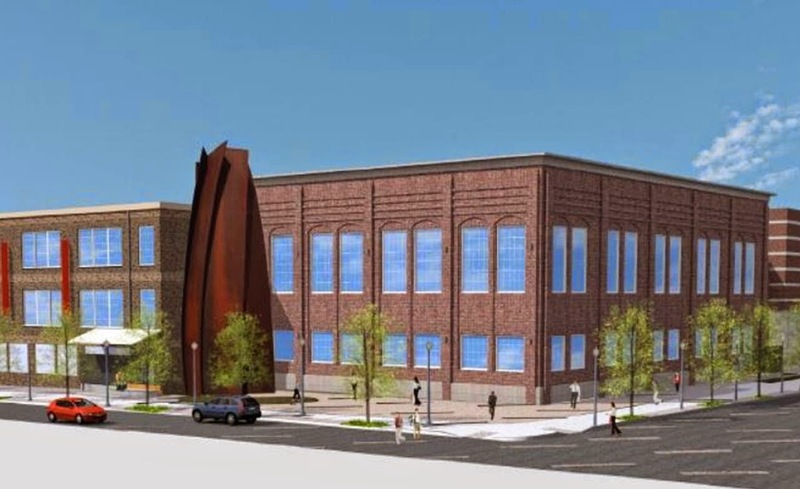 The front entrance to the museum will be on 4th Street and will be flanked by large bronze panels and stained glass depicting abstract biblical manuscripts. Former loading bays along D Street will be converted into large windows where passersby can see inside the museum. 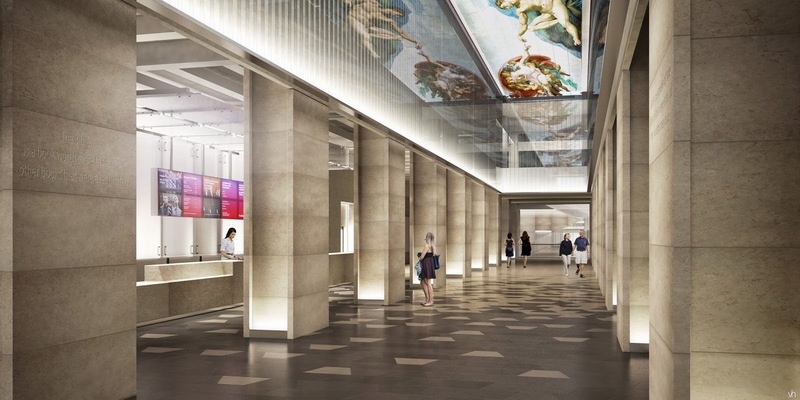 On the ground level, the grand lobby will have a 200-foot LED ceiling that can display a variety of images. 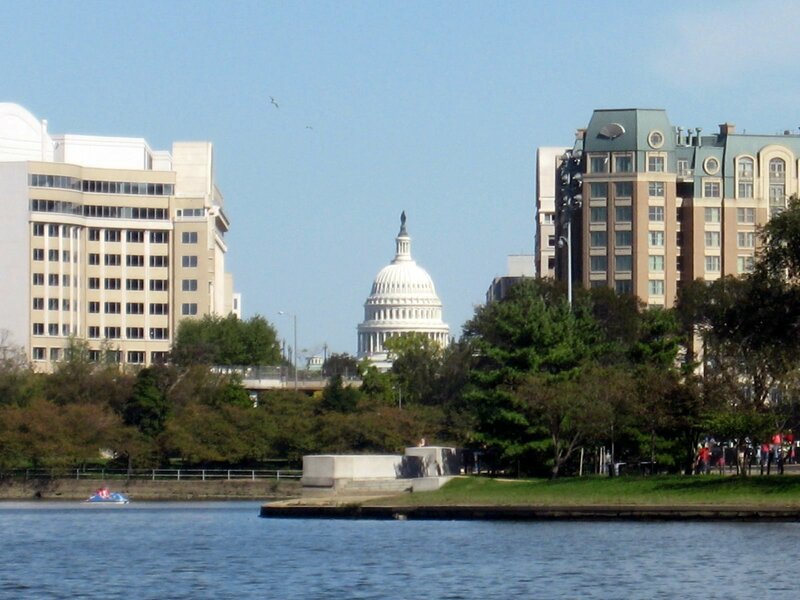 A two-level glass enclosed rooftop gallery addition will offer views to the north of the National Mall and the Capitol. A biblical garden and restaurant will also be located here, as well as a 500-seat performing arts theater and a 500-seat ballroom. Topping off the building will be a large green roof – the museum will seek LEED certification. There will be two dining areas in the museum – one will be an industrial style café on the mezzanine level overlooking the lobby that pays homage to the origins of the building’s former use as a warehouse and the second will be a restaurant offering foods of the Bible in a biblical garden setting on the rooftop gallery. 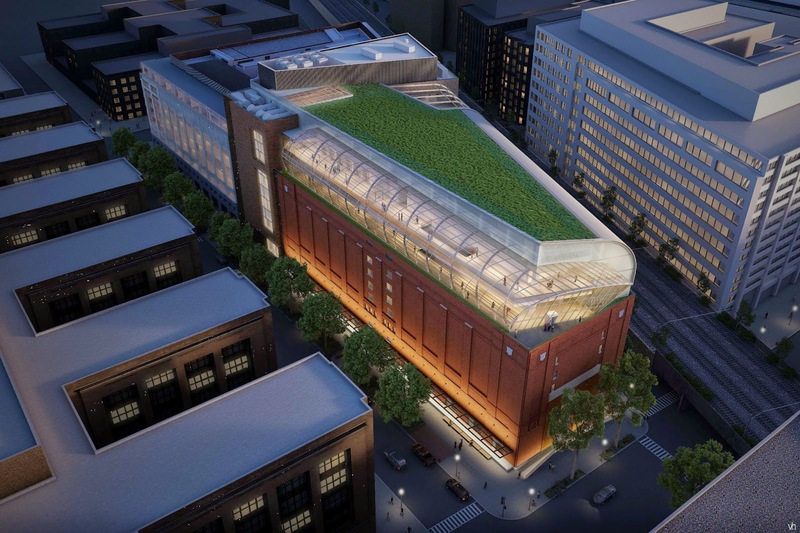 Museum of the Bible will include over 40,000 artifacts from the Green Collection, which has been collected by the Green family, owners of the Hobby Lobby retail chain. The museum is scheduled to open in the fall of 2017. A new intersection on Maine Avenue is scheduled to open this Friday at the entrance to the Maine Avenue Fish Market. This will allow patrons to make a left turn into the market off on Maine Avenue for the first time. The intersection will also help pedestrians coming south from L’Enfant Plaza cross Maine Avenue. 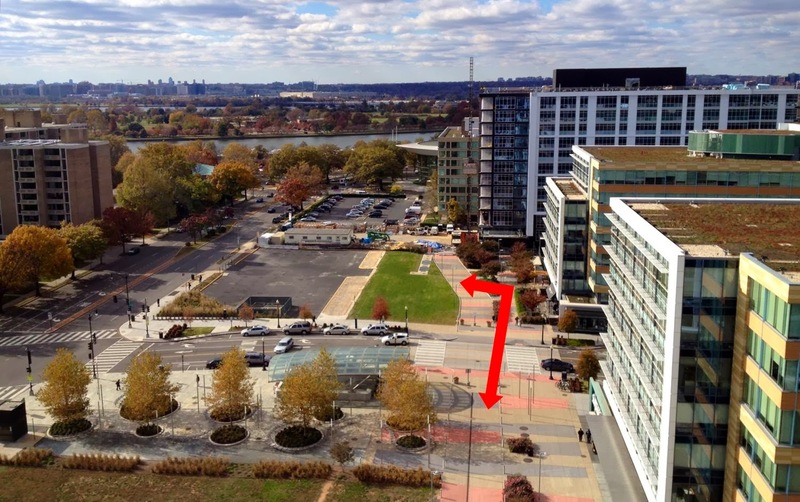 Eventually, there will be a new stairway leading down from Banneker Overlook to ease access to The Wharf development. In addition to the new intersection, a parking lot has been built for patrons of the market. Set in the 1980's Hill District of Pittsburgh, the ninth installment of Pulitzer Prize winner August Wilson's acclaimed play cycle examining Black America follows a scarred ex-convict who struggles to turn his life around and lock away his past. 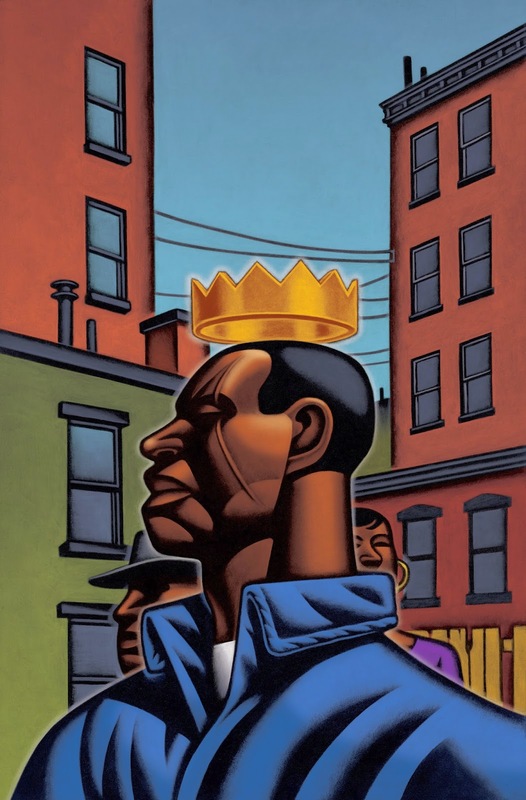 King Hedley II will be at the Fichlander from February 6 - March 8. People who reside or work in Southwest can buy discounted tickets for specially designated Southwest Nights performances of each production. Tickets are $35 for musicals and $25 for non-musicals, plus fees, and patrons may purchase tickets by phone (202-488-3300) or in person (1101 Sixth Street). Proof of Southwest residency or employment for each member of the party must be presented at the time of pick-up. Tickets are based on availability. In what would be the first residential building south of the Mall and north of the SW freeway since urban renewal, Republic Properties has proposed a 15-story, 440-unit residential building at 1399 Maryland Avenue, one of the remaining undeveloped parcels at The Portals. This site was originally planned as office, but Republic Properties switched course and now wants to move forward with the project as residential. The Portals currently includes three office buildings and the Mandarin Oriental Hotel. With this new residential building added, there would remain one undeveloped parcel which is currently slated as office. Currently, the area south of the National Mall and north of the SW freeway is primarily an office zone (save for a few hotels) which shuts down after work hours. With this new residential project that image may start to change. The SW Ecodistrict Initiative calls for at least 1,000 residential units in this area of Southwest in order to increase the mix of uses and help turn the area into an 18-hour, live-work-play neighborhood. Although technically outside of the SW Ecodistrict Initiative borders, introducing residential to The Portals may incentivize others to eventually do so within the Ecodistrict. The Commission of Fine Arts (CFA) reviewed the concept plan for the residential building back in November and expressed concern about the project’s height and design. In addition to being the first residential building in this area of the District, 1399 Maryland Avenue would be among the tallest buildings in the city, since Maryland Avenue is elevated above the rail tracks by 46 feet or so and the 130-foot height is measured from the street surface, not ground level. The other buildings at The Portals are 90 feet tall. With regard to the design, the CFA was concerned that the proposed building’s prominent location at the entrance to the monumental core of the city from the 14th Street Bridge should not have a building that does not stand out too much or is too complex. The Commission requested that Robert A.M Stern Architects refine the design to address these issues. The above and below renderings show the revised concept. While finding the revised design to be considerably improved, the Commission made several recommendations for the development of the design and did not take a formal action on the concept submission. Republic will need to refine the design further and resubmit the project for review by the CFA. The WBJ first reported on this story.